MOC: This music player for Linux is fun! Music on Console aka MOC is perhaps the most lightweight and easy-to-install music player for Linux I have ever tested. And don't be intimidated by the fact that MOC is a console only player. 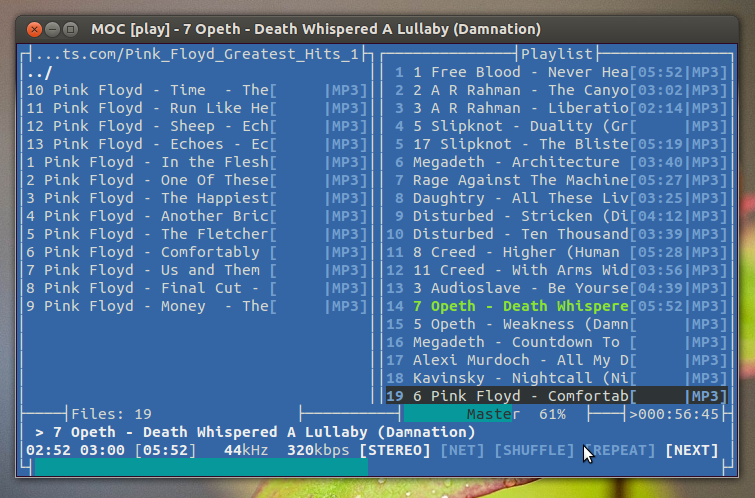 Once you spend enough time with MOC, it becomes as easy to use as any other alternative music players for Linux. Moreover, if you're a fan of MPD plus NCMPC combination who doesn't like to jump through hoops just for installing and setting it up, MOC might be the alternative you have been looking for. It's right there in Ubuntu repositories by default. 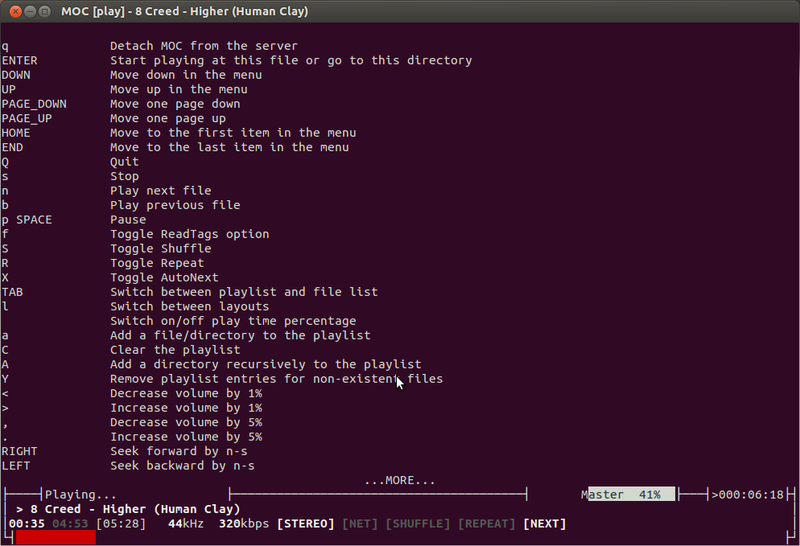 NCMPC and NCMPCPP are two of my favorite console-based music players for Linux. But when compared to MOC, those MPD clients are just not as easy to install and setup. One of the many interesting features of MOC include the ability to detach the interface while keeping the server running resulting in uninterrupted music even when you have to close the Terminal. MOC plays smoothly, regardless of system or I/O load because it uses the output buffer in a separate thread. Also, it provides gapless playback because the next file to be played is pre-cached while the current file is playing. Supported file formats include MP3, Ogg Vorbis, FLAC, AAC, Musepack, Speex, MOD, WavPack etc. Most Debian based Linux distros like Ubuntu, Linux Mint, elementary OS, Pingus OS etc. will have MOC as default in its repositories. OR simply copy-paste this command on Terminal. Done. MOC is installed and ready to go. There is nothing to set up actually. Just run the command "mocp" (without quotes) in Terminal and there you have it. Hit the letter "h" and the help menu will pop-up. Plenty of shortcuts to control MOC. Don't be intimidated by it, you'll probably have to use 5 or 6 of them regularly. And its all very intuitive. There are a few themes to play around too, as you can see in the above screenshot. I have been using MOC for more than a week now and I'm pretty impressed. Give it a try and let us know your opinion. Also, more MOC tips and tricks are on its way. So stay tuned and thanks or reading.